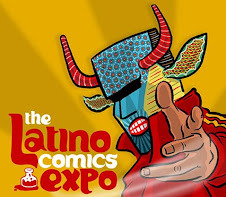 This is the first-ever group art show for the Cartoonistas! 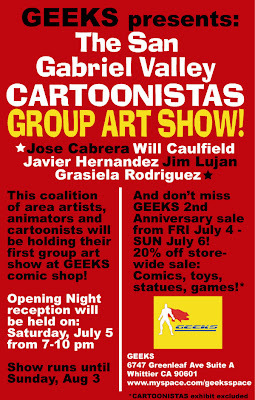 The Cartoonistas is a group of San Gabriel Valley artists/cartoonists/animators that I helped co-found with my friend Jim Lujan, web-toonist extraordinaire. Jimmy had a dream to unite his fellow creative individuals from our area. Well, who am I to not help another artist with his dream of cartoon glory? We're still slowly putting the group together, but we had a chance to partner with Geeks during their 2nd Year Anniversay Sale this Independence Day Weekend so here we are! We know a great opportunity when we see one! I'll post more about this event in a few days (I'll even include a pic of one of the new paintings I'm creating for this show!). Blake Bell interview on PCBR is a hit! Several of my very good friends each told me how much they enjoyed the interview I did with Blake Bell on my radio show on Tuesday, June 24. 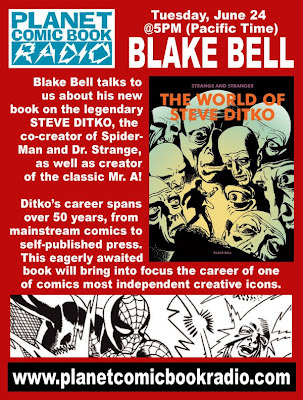 Blake was talking about his brand new book called STRANGE AND STRANGER: THE WORLD OF STEVE DITKO. Blake is expertly versed in the work of Steve Ditko, of course. 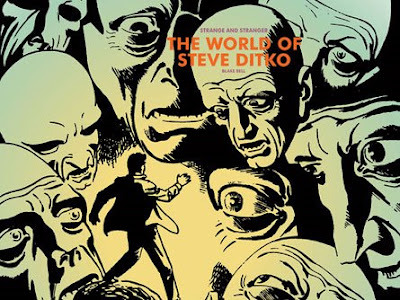 Not just for the last several years worth of research for his book, but he's maintained the internet's premier Steve Ditko website for 10 years. 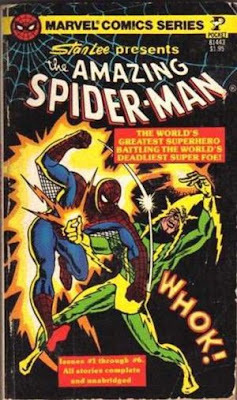 Blake talks about his first exposure to Ditko's work in the form of this 1977 pocket book reprinting the first six issues of Amazing Spider-Man. I tell folks that the interview works so well because the guest is knowledgeable, passionate and articulate. I did indeed prepare for the show with more extensive notes than usual. Mostly to keep us both on track. There is so much to talk about in Ditko's 50-plus year career, as well as the path his choices have taken him. And to be honest, the third thing I credit for such a successful podcast is that Blake and myself are diehard fans of Steve Ditko. Another thing I loved about doing this episode was that I had my nephew Christian hanging out with me in the studio, listening in to my interview with Blake. Well, after talking to Blake, I decided to do an impromptu interview with Christian! While he's not a comic book artist, he has picked up the art bug (From where, I don't know....). Anyway, we talked about his drawings and paintings, and even a little bit about when his Uncle J used to by him McFarlane Spawn action figures! I'm really glad I took Christian in the studio with me. I've been hoping he'd one day accompany me, and this was a perfect episode to have him on. He's probably heard me talking about Steve Ditko for most of his 17 years! That's the great thing about doing this radio show with the fine folks at Perspective Radio. I have carte blanche to produce the show the way I see fit. Of course my objective is to create a popular show that brings us a loyal audience, and a good amount of sponsors. 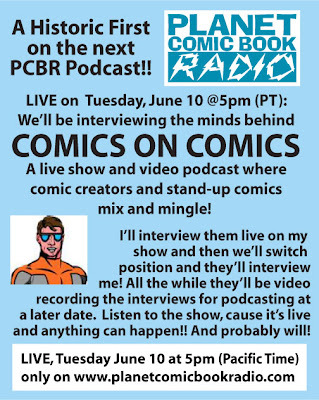 But I get to have a weekly show were I talk to such a wide-variety of people creating comics in print, the web and even syndicated newspapers. 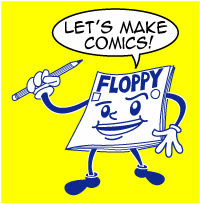 And I also talk to people who create websites and books and products drawing from many aspects of the comic book culture. Blake, thanks for providing my show with an amazing hour of interesting dialoge on one of my creative heroes. And Christian, thanks for hanging out with Uncle J. Love ya. He took a sketch of mine and finished it with his mighty brush and nuclear-powered color palette! Thanks, Mort. 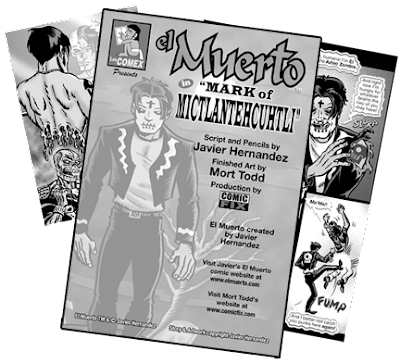 Mort and I worked on the mini-comic book that's included in the EL MUERTO DVD. He finished the art and colored it in grayscale. I like working with him on projects because we have a similar enough sensibility about comics but also we have enough differences in our approaches that it always leads to a good hybrid. Mort's got about a quarter century experience as a comics pro. 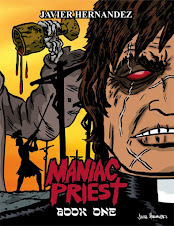 His work has ranged from comics, strips, film, television and the web. 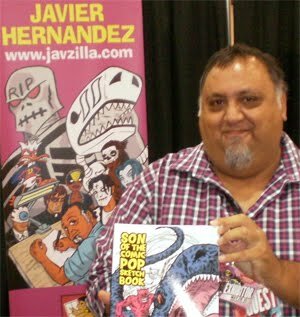 I had the chance to interview him on my radio show, PLANET COMIC BOOK RADIO where we talked about everything and everyone from Dan Clowes to Steve Ditko to Speed Racer! He and I will certainly be working together again! This past Friday the 13th turned out to be a lucky day for the 4th Grade students at Daneil Phelan Elementary here in Whittier. 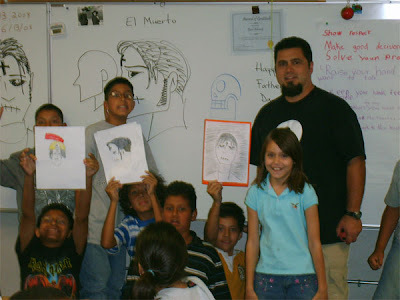 I visited the class and talked to the kids about El Muerto, art, comics and film. 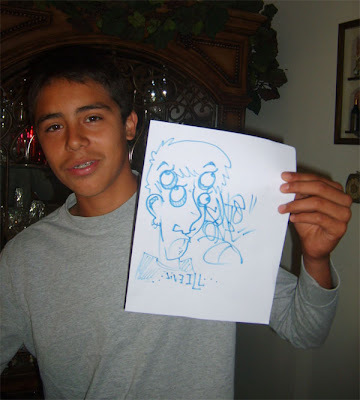 A few years ago, an old High School friend of mine, Raul Almada, attended one of my gallery shows in the area. I had seen him a couple of shortly after our High School days, but it had been some time since we had seen each other. I brought him up to speed on my comic book and film project, and we talked about the 'good ol' days' at Whittier High. I used to draw these little one page gags about several of our teachers, particularly coach Kelly and our geometry teacher Mr. Vickers. Well, in the years following High School, Raul had become a teacher himself. About three years ago he started to invite me to speak to his class, usually around the last week or so of school. So this past Friday's event was my third in a row. There was Raul, or Mr. Almada, as refer to him in front of his students, decked out in his El Muerto T-shirt, awaiting my arrival. I usually arrive during the lunch hour when the kids are out on there break. Raul's wife will bring us some great lunch (Los Sanchez!) and we'll talk and catch up. It's funny, but everytime we're eating, there will be a steady stream of kids popping into the class to check out the guest. They have all kinds of excuses for entering: "I came to get some water", "I need a paper towel for my wet shoes", "I came to help Edgar get another ball"!! Of course, Raul has to firmly remind the kids to stay outside the class during the break (I mean, there are plenty of water fountains outside!). I tell Raul I'm flattered by the attention, but he brings me back to Earth by saying that they do that to anyone visiting the class!! Well, once the bell rings and the kids come back to class, they march in and there are about 30 pairs of eyeballs staring at me! Okay, I guess I'm on! I keep my 'routine' very spontaneous, trying to tie my love of art with my early school days. 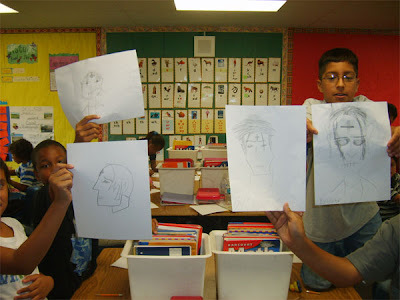 This way the kids see me as someone who just like them, enjoyed drawing as a kid. Who knows, we may have a future artist in the group. They all seem pretty hip to the idea of El Muerto, as Raul has a very well worn copy of El Muerto that the kids have read beforehand. 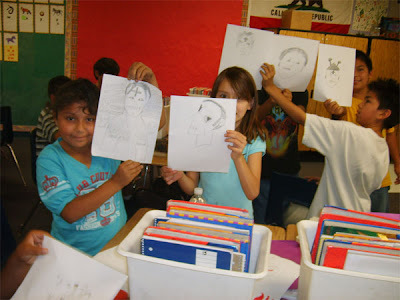 He also tells them about the funny drawings I did of our High School teachers, and the kids ask me about those too! Near the end of the visit, Raul had the kids work on Father's Day Card to take home over the weekend. 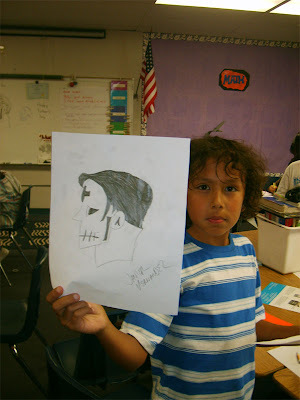 I was amazed by some of the kids who would glue their Muerto drawings in the cards! Some asked me to sign them as well. 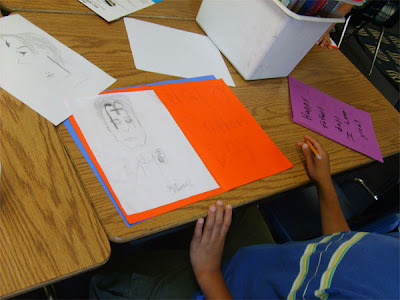 It's funny to me that there were some Dads today in Whittier that received hand-made El Muerto cards from their kids! Pretty awesome. 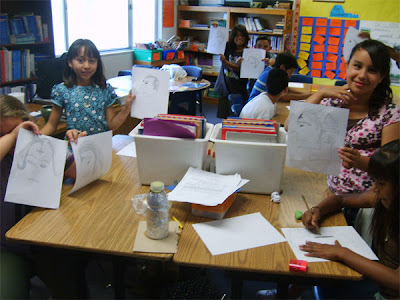 At one point as the kids were drawing, Raul joked to me: "Hey, you have to get a 25¢ commission everytime one of these kids draws your character". Well, I guess one little girl heard what he said, because the next thing I know, she comes up to me with a blank sheet of paper and a quarter! I felt terrible! I immediately told her that the drawings are free and gave her a quick drawing. At the end of the visit, I gave each student a signed copy of one of the comics. One kid asked if I could sign one for his father, which I was happy to oblige. I have a great time with these visits. Sure, it allows me to talk about my work, but really, it gives a kid a chance to meet someone that is doing something creative and may spark an interest in them to do something similar. When I first arrived on the campus, one kid called out to me "Do you remember me from last year?". Of course I told him yes! But that really shows that these type of visits can leave a good impact on someone. That to me is what makes most of what I do worthwhile. 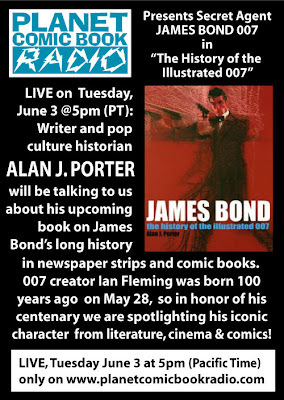 Tomorrow's guest will be talking about a book he's written on the history of James Bond's appearances in comic book and newspaper strips! And remember, you can now subscribe to my radio show via iTunes. Just go to the iTunes store, search for PLANET COMIC BOOK RADIO and hit the Subscribe button! Each new episode will be delivered directly to your iTunes library once it's posted on the show's website.